Monchique,high town of Algarve Atlantic views. Click to go back to main Algarve Information menu. IntroductionThis quaint little town nestled almost cosily between the 2 high mountain peaks;up to 900metres above sea level;will make you marvel at mans detirmination to build whereever he wants.The two mountains are known as Foia and Picota and to apreciate how high and steep they are you need to go there in a vehicle,preferably a coach trip ,up the narrow trechurous,winding roads. In a coach at times you will marvel how you are staying on 'tera firma'. Believe me this is one of the best trips to take on the Algarve.It just shows you 'algarvian' lifestyle as it has been for generations. It is known that parts of the town go back to Roman times and even before.I always feel amazed how so say ignorant ancient man managed to establish lasting colonies in inaccesible places such as this. PopulationEven more amazing to me,is the fact that this seemingly tiny little cobbled village has around 10 thousand inhabitants.It just does not seem possible!Things To See and Do.One of the most prominent pieces of architecture in this Algarve town is the rather poorly maintained Franciscan Monastery;amidst tiny cottages.One can well imagine that in harder times gone by,they would have been vital to this isolated community.Without modern transport it must have been an arduous trip on foot or on horseback,just getting yourself up there;let alone you and vital supplies in times of hardship when weather conditions rendered passage almost impossible.Often we curse modern engine driven transport but really it is essential.It just takes somewherelike this to make us realise. See the Cork oak trees.You can see wonderfull handbags and the like made from cork.You would never believe such things could be made out of cork,untill you set eyes on them.Of course the cork was and is used on a large scale to make wine bottle corks. There is a tourist centre and craft shop atop the mountains and here you can try their local alcoholic drink made from the strawberry tree Arbutus unedo.The tree is fabulous;I have one in my own front garden and the drink is superb as well.It packs a 'hefty punch' I can report.Sip your trial very carefully.As I remember; it is called Madrone after the common name for the tree. 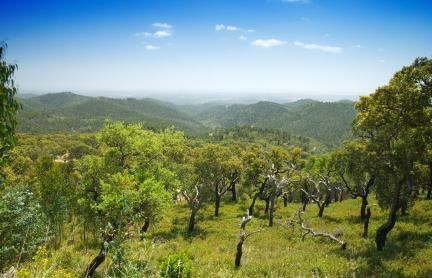 The picture at the top of the page shows a view from on top looking across and down the mountains at the Quercus trees,known as the cork oak.This obviously is where the cork is harvested from. There are numerous hotels and bed and breakfasts up in these mountains and I can assure you there is plenty to do and see up in this lofty perch of Monchique.I reckon the time from Faro airport would be around 80 minutes,so not too far for those wanting to take a mountain holiday.Here you will find the "sacred spa waters" as the romans used to call them.This is a very different Algarve;peacefull and calming and the perfect way to explore the inland regions.The regions of traditional architecture and masses of fruit tree gardens. 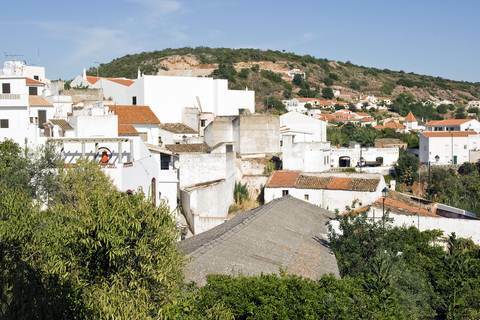 The historic town of Silves is close by and the beaches of the coast are about 20 minutes drive.So you are by no means isolated if staying here. 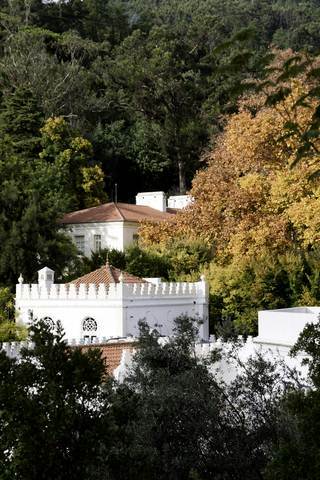 Monchique is an ideal holiday location for those seeking tranquility albeit with plenty to keep one occupied. Caldas de Monchique. Discover Villa Termal das Caldas de Monchique the famous Spa Resort .Set amongst the the beautifull green hills and known for the feeling of wellbeing the Spa imparts.It is classed as an exquisite villa formed by hotels which have been built in restored ancient buildings.There is a thermal outside pool,thermal spa,meeting rooms,shops and a wine bar and restaurants,all in the resort spa. For the hikers visiting the mountains.See if you can find this waterfall and I wonder how many you could find as you ramble around.With the terrain I should guess there are plenty like this.This is where I envy all who can walk unaided.Make sure you enjoy every minute.I thought I was indestructable and was fit and strong as an ox.Leg through glass ended my energetic days. The outdoor swimming pool is set in green grounds and padded lounge chairs are situated all around for the guests. Pleasant time can be spent relaxing in the sauna or a steam bath. Guests can enjoy walking and mountain biking tours and even horse riding in Serra de Monchique National Park.Rooms start from around 40euros.The West Algarve beaches of the Atlantic ocean are a mere 12 miles drive from the Villa Termal Das Caldas de Monchique. Guests have described the views as outstanding from this 17 room hotel/The Estalagem Abrigo da Montanha is built of granite and with wood. The restaurant and sitting room both have a cosy atmosphere with a sense of well being. The hotel and guest rooms are all tastefully furnished in a comfy' rustic style. Outside there is a private pool with terrace decked with sun loungers and parasols. There is also a large dance floor with a bar area. Quaint whitewashed hamlet of houses up in the mountains of Monchique.There is so much to see and do.This area makes a unique holiday and is less than 20 kms from lovely sandy beaches.Or visit it on one of the many tours which go here throughout most of the year.